Canadian federal government is facing ire of a large section of people over rejecting the sanction for Taskeo Mine’s “New Prosperity Copper mines in British Columbia Province. Federal government rejected the proposal on the basis of some environmental issues. Earlier the provincial government has given sanction for the project. British Columbia, the westernmost province of Canada is being inhabited by more than 4 million people and the economy is mainly based on the natural resources. 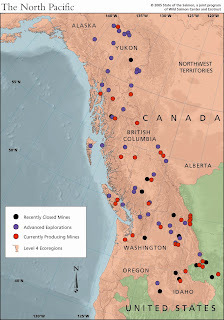 According to the locals, almost all businesses running in BC depends totally on the income from the mining sector. At present there are a few mining companies who are the major employers in this region. Had the government approved the proposal for the new mines, it would have been a boom to the economy of the province. It is estimated that about 11 billion dollar would have been credited to the government in terms of taxes had the new mines started functioning. “A lot of good chances for development have been missed by this decision. Once the new mine started functioning, it would have brought in many changes in all sectors and the region would have experienced a growth.” Many people aired their opinion unanimously. The reason pointed out for rejecting the proposal was some major environmental issues. Many environmentalists and First Nations Groups raised their voice against the proposed destruction of the fish lake for using the same as tailings impoundment. However, Teskeo, the promoters of the project has included an additional amount of 300 million dollars to take measures to minimize the environmental impacts caused by mining and for preserving the fish lake. However, the Federal Government seems to be not fully convinced about it and they rejected the proposal respecting the sentiments of activists. Investors are watching the incident closely and many feel that his decision will be a setback to the region as mining is the only sector in British Columbia where one can invest safely.